Customize the emails you receive from The 912 Group and its media outlets. 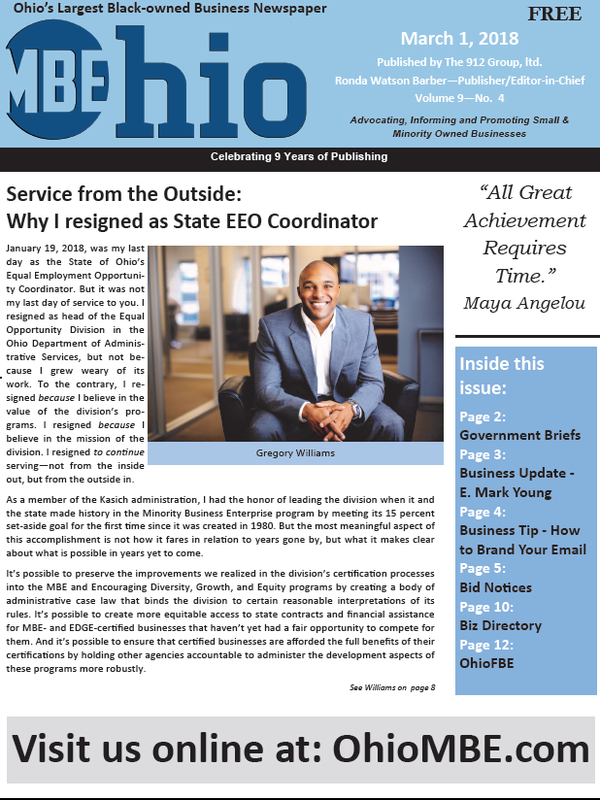 The March 1 issue of OhioMBE features former Ohio EEO Coordinator Gregory Williams. It also includes bid notices, a calendar of events, business tips and a business directory. Get your ticket today to make new contracting connections at the March 15 OhioMBE Procurement Fair, hosted by Columbus Metropolitan Housing Authority. Small businesses get 15 minute appointments to meet one-on-one to promote their product or service. Last year, participants who attended had access to over $350 million in contracting opportunities. Organizations confirm their participation on a regular basis, please check our website or social media for updates. "If you have a business and you don't promote it, then maybe it's just a hobby? Customize the emails you receive from The 912 Group and its media outlets. Click "Update Profile" (in the footer of this email ) to select what publications will be forwarded to your inbox.